Nobelium (No) was created in 1957 at the Nobel Institute for Physics in Stockholm Sweden by bombarding Curium with carbon-13 ions from a cyclotron. Virtually none exists on earth because its half life is about 10 minutes. 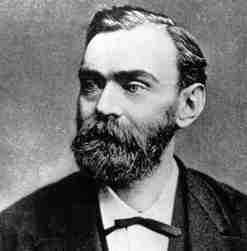 Alfred Nobel (1833-1896) invented dynamite. He was born in Stockholm and educated in St. Petersburg (Leningrad for much of this century), and later studied engineering in the U.S.A. He tried to make the unpredictable nitroglycerine into a safe and useful explosive. He created dynamite in 1867 by combining nitroglycerine with an absorbent medium. He became very rich but felt guilty when the explosive was used for warfare. He established a fund of about $9 million with the interest to be awarded as annual prizes, one of which was for work promoting peace. Nobel also worked on synthetic rubber, artificial silk, and other products.